A fresh young talent, Christie Lamb is a rising star of Australian Country Music, whose high energy performances never fail to impress. The past three years has seen Christie given the opportunity to perform at the Sydney Entertainment Centre as pre show entertainment for the likes of Pink, Dolly Parton, James Taylor, Carole King, Cat Stevens, Meatloaf, Evanescence and Thirsty Merc. Last year she cut her teeth on stages around the nation in front of sell-out crowds alongside the incomparable Jon English. Cast as the Lead Female Vocalist in his Nationwide ‘Rock Revolution’ Tour, Christie was able to successfully showcase her powerful voice, as well as display her prowess on guitar and piano. During the production, Christie also found time to complete her Bachelor of Music at the University of Western Sydney. Lamb maintains a strong connection with her large loyal fan base both in person and on social media and her public profile is accelerating. 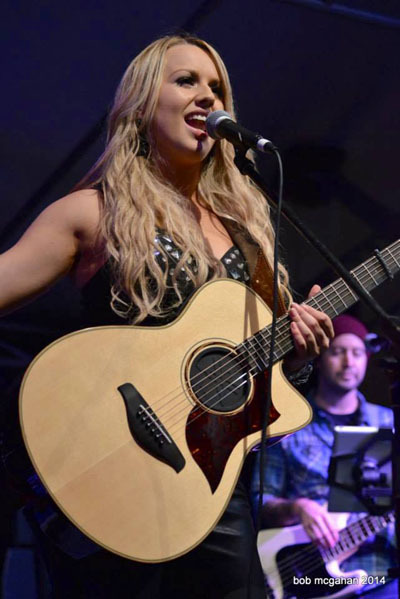 Previously appearing as a Featured Artist at numerous Country Music Festivals around the country, Christie is clearly a talent that has been turning heads. Upon releasing her self-titled debut EP in December 2011, Christie would go on to release two Top 5 singles to Country Music Radio and earn a position in the ‘Top Ten Biggest Hits of 2012’. This resulted in Lamb being announced as the ‘Most Impressive New Talent’ on Country Music Radio Australia for 2012 and ‘Rising Star Female’ Winner at the Southern Stars Awards - Australian Independent Country Music Awards 2013. Lamb undertook two writing trips to Nashville as groundwork for her debut album. This sassy young lady's recent win with her track ‘Love Me Tonight’ at the APRA supported Songs Alive Australia Song Comp for ‘Pop Song of The Year’ is a testament to her writing chops. Christie’s debut album ‘All She Wrote’ jumped in at #2 first week on the ARIA Australian Artist Country Chart and #3 on the Country iTunes Chart, while the single and title track hit Top 5 on The Music Network Country Airplay Chart and ultimately hit the #1 spots across Australian Country Music Radio Stations – pretty exciting stuff for this young woman chasing her dreams. 2014 is set to be the year where Lamb continues to turn heads; with a very successful Tamworth Country Music Festival, a run of Victorian and Queensland dates, a sold out album launch, #1 single with the album title track ‘All She Wrote’ and a bunch of accolades for the album. Lamb has also just secured bookings on some of Australia’s premier Country Music events, including Cruising Country 2015, Gympie Music Festival and Mud Bulls and Music Festival 2014.